Hampshire breed free range pork is renowned for its flavour and succulence, and makes a perfect roasting joint. Preheat the oven to 180°C, gas mark 4. Weigh the joint to calculate the cooking time (see above), then season with freshly ground black pepper. Heat a large frying pan to smoking point, add the meat and seal on all sides for 3-4 minutes, until golden brown, then transfer to a roasting tin. In the same pan, melt the butter then add the onion and rosemary. Sauté for 5 minutes until the onion has softened slightly, then tip into the roasting tin and pour over half the vinegar. Make sure the meat is well coated. Place in the oven and cook for the calculated time, stirring the onions occasionally and basting the pork. Forty minutes before the pork is ready, add the apple halves to the tin and pour the remaining vinegar over. When the apples are tender and the pork is thoroughly cooked with no pink meat, remove the joint from the roasting tin and allow to stand for 10 minutes before carving. Place the apples in a serving dish, cover with foil and keep warm until ready to serve. Stir the wine into the juices in the tin and simmer for 3-4 minutes over a medium heat. Serve the pork with the apples and a little juice, with creamy mashed potatoes and lightly sautéed courgettes. 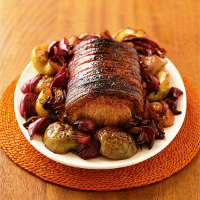 Serve any leftover pork cold and thinly sliced, with jacket potatoes and salad. Have your joint cut to the size you require at the Meat Service Counter, where staff will also be able to offer help and advice. Toasty oak flavours complement the berryish character in Mas Collet, Celler de Capçanes, Montsant, from Spain, a soft, juicy wine that is just right with pork and tangy apples.